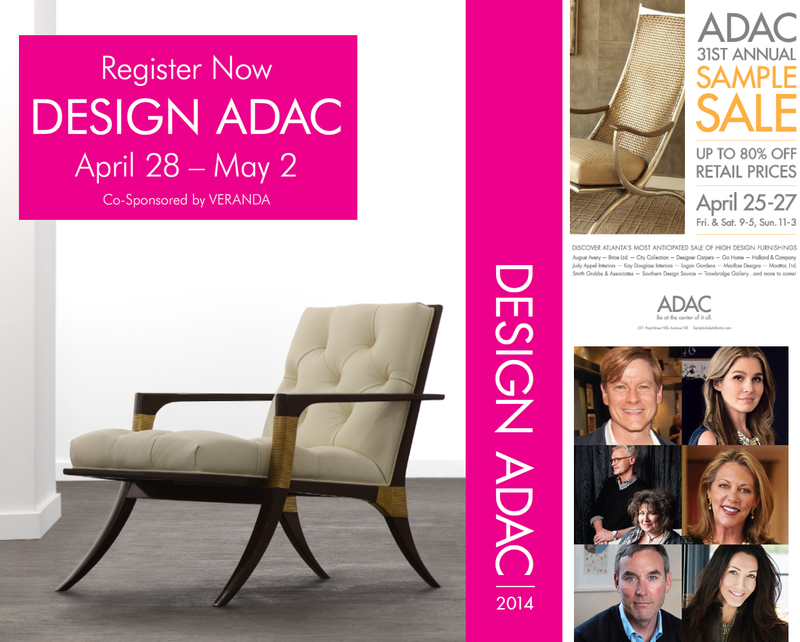 ADAC (Atlanta Decorative Arts Center) is just about to kick off a week of design highlights not to be missed! Friday April 25 - Sunday April 27 is their 31st annual SAMPLE SALE.... Over the course of 3 days and held in the lower level covered parking area, participating ADAC showrooms will be offering current inventory at too good to resist prices. Monday April 28 - Friday May 2nd, register now for DESIGN ADAC, a week long event sponsored in part by Veranda magazine, offering a chock-full forum focused on current interior design, emerging trends & new-to-market products, and taste-maker led panel discussions (pictured bottom right) including Chuck Chewning, Aerin Lauder, Bobby McAlpine & Susan Ferrier, Suzanne Tucker, Brian J. McCarthy, and Windsor Smith. Another aspect to the week will be the unveiling of ADAC: BEHIND THE WINDOWS.... Style and product converge in these decorative installations pairing noted interior designers with ADAC showrooms.